So begins the second annual Young People’s Concert as Schick guides an audience of children and their families through a presentation of selections from Gustav Mahler’s celebrated Fifth Symphony. With eyes shut and imaginations open, the young audience is taken on a journey of Mahler’s life, which is the inspiration for his symphony. Schick introduces featured instruments and melodic themes, emphasizes the unique connections both composer and listener draw from musical expression and personal experience, and fields questions from the audience. As funding for the arts in San Diego area schools continues to languish, outreach by arts presenters has become a vital component in public education and awareness. It is in this spirit that the community-based La Jolla Symphony and Chorus inaugurated their Young People’s Concert. Don’t miss this fun and inspiring concert. 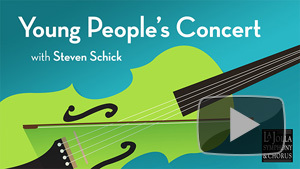 Watch the Young People’s Concert, Featuring Gustav Mahler.